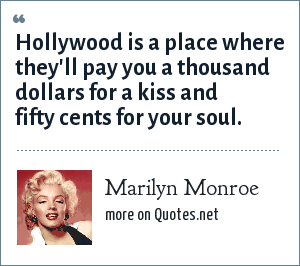 Marilyn Monroe: Hollywood is a place where they'll pay you a thousand dollars for a kiss and fifty cents for your soul. "Marilyn Monroe Quotes." Quotes.net. STANDS4 LLC, 2019. Web. 23 Apr. 2019. <https://www.quotes.net/quote/15759>.